When it comes down to creating happy memories, what kind of entertainer are you? Do you like to make others feel special and loved? If you do, Food with Friends is the cookbook for you. 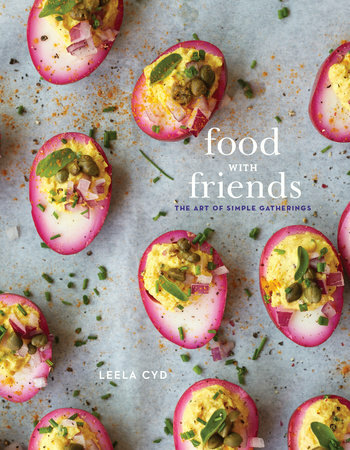 Leela Cyd the author is a food, lifestyle and travel photographer and she is based in Northern California. Many of her food and spices are from her travels around the world which she blogs about at LeelaCyd.com. The Food with Friends cookbook is focused on entertaining, the dishes are colorful and fun. Most have some sort of whimsical artsy twist that feels sincere and natural. There are six chapters: Breakfast and Brunch, Teatime, Happy Hour, Potlucks and Picnics, Desserts, and Tiny Takeaways. Every recipe comes with a beautiful photo and a personal introduction or story, which I found to be very charming. In her Onion Jam recipe she writes that it is so good she would happily marry a jar of it. Now that did it for me, later that day I made my own jar and it was delicious!! (see picture below). My favorite chapter was the “Style File” section. Here she talks about adding your own personal touches. Forget perfection and embrace what you love. It’s okay to add pine cones, driftwood or whatever it is that you treasure, use what you have. What I gleaned from this cookbook was that with a little work we can make our family and friends feel special and cared about. Whatever the occasion Leela Cyd will show you how to keep it simple but exceptional at the same time. Food with Friends is for the artist in everyone of us. It's such a pity you cannot share recipes from these books Cheri. I know, this book has such great recipes and ideas too. Thanks Tandy. Thanks Kim, you said it better than I, it is a charming book for sure. I would love to try that onion jam. Looks really great. Thanks Angie, it is fabulous, who would of thought that cooked down onions could taste so good. Oh gosh! That onion jam is so intriguing, Cheri. I will have to check the book right away! Have a lovely weekend! Thanks Anu, have a wonderful week-end!!! The onion jam looks delish. I'm with you ... keeping the food colourful with simple garnishing if I'm hosting events at home. Enjoy your weekends! Thanks Karen, it's always fun putting your own spin on things. The book sounds awesome! Perfect for all the entertaining we do during the summer! Love your onion jam too! Hi Cheri, Food With Friends sounds positively terrific, and certainly a genre many of us who regularly entertain could take some inspiration from! Sometimes I think I have so many food preparations in my head- it becomes overwhelming- so a book as this might give me a bit of ease. The Onion Jam looks terrific too. I'm really enjoying your ongoing 'summer series!' See you soon. Thanks Peggy, I can relate to what you wrote as I can easily get overwhelmed myself. Sometimes I have to remind myself that I am having fun. Have a wonderful week-end! I absolutely love to casually entertain. My favorite is Sunday Supper. Family and friends around the table. Thanks for sharing this post. Loved it. Thanks Velva, have a great week-end! Dear Cheri, I have been looking at this particular book for a while now - your post has me convinced now that this is certainly a book worth investing in. And your onion jam looks wonderful - love these little extra special and personal touches for entertaining guests. I do too Andrea, she reminds us that it can be fun and creative all at the same time. Take care! Onion jam, who knew? Thanks so much for reviewing the book. I am all about entertaining my guests and serving great food and a pretty table. You certainly are Linda, I could definitely take lessons from you. You really know how to set a beautiful table. Have a great week-end! What a nice concept for a book, Cheri. Thanks for the introduction. I have to say that the beet-soaked eggs (at least that is what I think they are) on the cover are so pretty! Yes that is exactly what they are. I liked how she encourages others to put their own special touches when entertaining. It's the little things that count. I remember reading about this book being in the works. That is a great review and sounds like a great message and a very nice book. I will keep an eye out for it, thank you! Thanks Monica, it is a beauty. This might so silly but I love the texture of the paper too. I"m going to order this book because it sounds like something I would love. This is such a great review, Cheri, and I normally spend a lot of time deciding on cookbooks before I order them (my house is overrun with books! lo) but you have me convinced. Love it and love the cover picture. And this is the best looking food blog! You've motivated me to go ahead and tweak some stuff on mine that I've been wanting to do forever. Congratulations on your new look - gorgeous! Ha! my house is overrun too but I can't stop myself. Thanks, Linda has done such a amazing job, everything works and looks so much better, I still can't beleive it! Love the premise of this book, Cheri. Very clever idea and something we can all use in our kitchen libraries. Thanks Barbara, you are so right. I like the fact that she impresses upon the reader to relax and make it their own, it's supposed to be fun. Hi Cheri, I love to cook for friends and family. Thanks for the book introduction, your onion jam look appetizing. Thanks Amelia, we loved the onion jam. I love your take-away from trying this cookbook. A great theme for certain! Sorry to be so behind - I have been so sick :( On the mend now and hope to keep it that way. Have a great week! So glad you are feeling better Tricia!! Take care! Sounds like a great book, and your eggs look delicious. Thanks Cakelaw, it is a great cookbook. Now that sounds like my kind of fun, my 2 favorites!! This sounds like my kind of entertaining! I'll be sure to check it out. Thanks Beth, love that she is saying it's okay to put your own spin on it. Thanks Kelly!!! so glad I made the change. Those eggs on the cover are beautiful! And the onion jam looks lovely, too! Sounds like a terrific cookbook. Thanks Liz, it is a wonderful cookbook! The pictures are wonderful!! This sounds like a cookbook I would really enjoy! I love to have friends and family over and feed them, but also make things pretty and fun. That cracked me up about her wanting to marry the onion relish! I feel like that about food sometimes! :) Thanks so much for a great review of this cookbook, Cheri!